By far the most prevalent test for evaluating coating ”adhesion”is the tape-and-peel test, which has been used since the 1930’s. In its simplest version a piece of adhesive tape is pressed against the paint film and the resistance to and degree of film removal observed when the tape is pulled off. Since an intact film with appreciable adhesion is frequently not removed at all, the severity of the test is usually enhanced by cutting into the film a figure X or a cross hatched pattern,before applying and removing the tape. Adhesion is then rated by comparing film removed against an established rating scale. If an intact film is peeled cleanly by the tape, or if it debonds just by cutting into it without applying tape, then the adhesion is rated simply as poor or very poor, a more precise evaluation of such films not being within the capability of this test. The current widely-used version was first published in 1974; two test methods are covered in this standard. Both test methods are used to establish whether the adhesion of a coating to a substrate is at an adequate level; however they do not distinguish between higher levels of adhesion for which more sophisticated methods of measurement are required.Major limitations of the tape test are its low sensitivity, applicability only to coatings of relatively low bond strengths, and non-determination of adhesion to the substrate where failure occurs within a single coat, as when testing primers alone,or within or between coats in multicoat systems. For multicoat systems where adhesion failure may occur between or within coats, the adhesion of the coating system to the substrate is not determined. Repeatability within one rating unit is generally observed for coatings on metals for both methods, with reproducibility of one to two units. The tape test enjoys widespread popularity and is viewed as “simple” as well as low in cost. Applied to metals, it is economical to perform, lends itself to job site application, and most importantly, after decades of use, people feel comfortable with it. 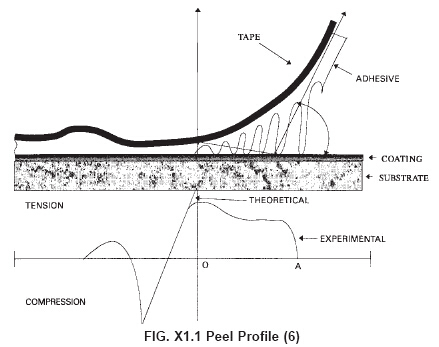 When a flexible adhesive tape is applied to a coated rigid substrate surface and then removed, the removal process has been described in terms of the “peel phenomenon,” as illustrated in Fig. X1.1. Peeling begins at the “toothed” leading edge (at the right) and proceeds along the coating adhesive/interface or the coating/substrate interface, depending on the relative bond strengths. It is assumed that coating removal occurs when the tensile force generated along the latter interface, which is a function of the rheological properties of the backing and adhesive layer materials, is greater than the bond strength at the coating-substrate interface (or cohesive strength of the coating).In actuality, however, this force is distributed over a discrete distance (O-A) in Fig. X1.1, which relates directly to the properties described, not concentrated at a point (O) in Fig. As in the theoretical case—though the tensile force is greatest at the origin for both. A significant compressive force arises from the response of the tape backing material to being stretched. Thus both tensile and compressive forces are involved in adhesion tape test. Close scrutiny of the tape test with respect to the nature of the tape employed and certain aspects of the procedure itself reveal several factors, each or any combination of which can dramatically affect the results of the test as discussed (6).